NOT Tony Soprano. Well…just for a moment. 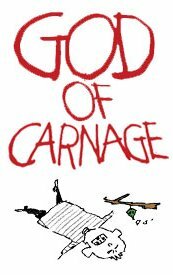 Saw the very funny God of Carnage by Yasmina Reza (who I am insanely jealous of) with the dream cast of James Gandolfini, Marcia Gay Harden, Jeff Daniels and Hope Davis. It opened back in March. Typically, a celebrity cast of this ilk would have bailed out by now because of other contractual commitments. But the four actors are having so much fun with their roles that they took August off and came back in September. It’s very unusual. They’re leaving for good in November so if you have half a mind to see it, you should do so before the new cast starts because who knows what’ll happen after that. Marcia Gay Harden is the best. She transitioned nicely from quiet, caring Brooklyn liberal tree-hugger to raging lunatic. Gandolfini didn’t display a shred of Tony Soprano, which is a pretty neat trick considering that The Sopranos is steeped into my consciousness. There was a moment when he was yelling at Jeff Daniels and he poked his two fingers in Daniels’ direction. That simple gesture placed him firmly back in the New Jersey mob, but only for a split second. Scarlett Johansson is the latest movie actor who’ll try to establish some stage credibility. (Can Gwyneth Paltrow be far behind?) This winter, Liev Schreiber (who I saw perform in a revival of Eric Bogosian’s Talk Radio and doesn’t need to prove anything to anyone) and the lovely Ms. Johansson (Women hate her. I can’t imagine why.) will revive Arthur Miller’s A View From the Bridge. I’ve seen that play and it’s pretty rough stuff. Liev is a longshoreman. Scarlett is his young niece. He likes her in that special way. Much trouble ensues because, as you know, it’s not polite to seduce your niece. Gwyneth did do something on the stage here. I forget what. It wasn’t well received. I remember reading that she just didn’t know how to project her voice for a live audience. Will look it up for you. Proof at the Donmar Warehouse in Covent Garden seven years ago.and now in discussions to possible come back to the West End in Chekhov’s 3 Sisters. James Gandolfini… now that’s my kinda guy. Ellie: I’m surprised that Donmar let her in the house at all, much less on stage. [I like the new pic. ]HIF: I’ve been called lots of things, but never that!Jimmy: This is a play I think you’d love. 4-hour Othello? I wouldn’t recommend it. Just as i stated in regard to Mr. Jackman, i’d watch Ms. Johansson polish a pair of loafers for 3 hours… i’m an equal opportunity drooler. “He likes her in that special way”. Bwahaha. You just made my day. I’m green with envy *sigh*Are you also going to see Idiot Savant with William Dafoe?That would make me positively emerald! Daisy: In that role, she has to be a seductress! Not a huge stretch for her. I generally don’t see plays that I’ve already seen before (limited funds) but I might make an exception.Sid: I originally wrote something more obvious and crass but I think you got my point. Nurse: All of those Wooster Group productions scare the hell out of me.